Received at the international airport and transfer to the hotel for overnight stay. Take a Old Delhi tour with visit to Raj Ghat, Red Fort, Jama Masjid. Later in the afternoon drive down to "Pink City ", Jaipur. Take a tour of Jaipur with visit to Amber Fort, Jantar Mantar, Hawa Mahal, City Palace. In the evening departure transfer to Railway Station to board the train for Jodhpur. Received at Jodhpur Station and transfer to Hotel for overnight stay. Walk through the Mehrangarh Fort, Jaswant Thada, Umaid Bhawan Palace, Museum. Later drive down to Manvar a modern day camp located in the desert. In the evening enjoy camel ride and watch the setting sun in the desert. Morning enjoy camel ride and watch the rising sun. Later in the day leave for Jaisalmer,the desert fortress. Take a tour of Jaisalmer City with visit to the Fort, Tazia Tower.Spend the overnight in a hotel. Take a tour of the city with visit to famous haveli of Jaisalmer. Some of them being Nathmalji-ki-Haveli , Patwon-ki-Havelie, Salim Singh-ki-Haveli - this 300 years old Haveli. Afternoon free and discover the fort city on your own. Evening camel ride at SamDunes. Drive down to Bikaner via Pokaran and Kolayat .Overnight at the hotel. 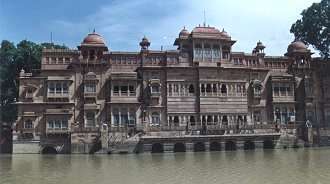 A tour of Bikaner city takes you to Junagarh, Lal Garh Palace, Ganga Golden JublieeMuseum. In the afternoon drive down to Pushkar, the venue for the famous " Pushkar Festival" via Deshnok temple or the rat temple. Take a tour of Savitri temple, Man Mahal - on the banks of Pushkar lake.Drive down to Sawai Madhopur better known for it's close proximity to Ranthambhore National Park.Evening game drive to the park. Early morning and evening jungle excursion to park. Early morning game drive to Ranthambhore National Park which use to be the royal hunting ground for Maharaja of Jaipur. Later drive down to Agra - "City of Taj Mahal". Visit the famed monument Taj Mahal that took 22 years to complete, Agra Fort located on the banks of Yamuna. In the afternoon drive down to Delhi and transfer in time to international Airport for onward destination.